assigned is a series of pieces which is partly drawn from my modular composition project #[unassigned] , a series of pieces which I worked on exclusively from 2000-9. The original #[unassigned] project led to over 175 versions of the piece, which was flexible in its construction, with each version being formed by a combination of newly composed and pre-existing modules. The nature of the #[unassigned] project meant that each version was entirely different, depending on instrumentation, available time, and the particular deployment of material. The versions were composed for a specific performance and normally performed only once. Each version was a bespoke composition for the performers, and allowed me to embrace unusual and interesting situations as I worked (for example, using non-standard or rare instruments, different performance spaces, or variable levels of performer ability). There was no definitive score or version of the piece as all display different possibilities within the boundaries of the project. On completing the project in 2009, I decided to make a selection of my favourite versions available for performance under the title assigned. Although the original concept for the piece was to present one configuration of the material in each unique performance, many of the versions did not rely on specific circumstances and so were suitable for further realisations. I wanted to see how other musicians might work with material originally intended for a known context. Thirteen of the current assigned pieces were drawn from versions of #[unassigned] made between 2002-8 and include an hour-long cello piece originally made for Stefan Thut (#230605, now assigned #6) and the large-scale version for Ensemble Modern (#211007, now assigned #1). Since then I have added a new version for solo double bass, assigned #12, and assigned #15 on this disc. The new versions use only the material from the original project, and it was strange to be working with material I first developed 14 years ago. Appropriately though, this recording is with Apartment House, who were the performers of the very first #[unassigned] in 2000. Since then, Apartment House and its individual members have performed many different versions of the piece, and consequently understand it so well. Recording the piece in St. Paul’s, Huddersfield, also felt apt as it was the most-used space for the original project and had a defining role in developing the soundworld of the composition over its nine years. This recording provides the materials to make a version of my ongoing modular composition #[unassigned]. The piece is flexible in its construction, with each version being formed by a combination of newly composed and pre-existing modules. each version is different, composed for a specific performance, and normally only performed once. For this recorded version, the cds can be played individually or together on two cd players. Use the random play function where this is available to reorder the tracks to produce different versions each time. When played together the cds do not have to be synchronised. Available from a few places on the web, or contact me directly. Contains Ryoko Akama’s realisation of overlay (with transience). Available from melange edition. Contains Ensemble Modern’s performance of #211007, the version of #[unassigned] commissioned by Donaueschingen for the 2007 festival. Available from NEOS. 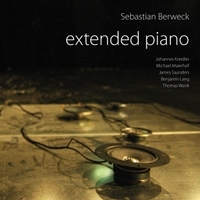 Compositions by James Saunders, Benjamin Lang, Michael Maierhof, Thomas Wenk, Johannes Kreidler Text by Michael Rebhahn ‘Leaving the comfort zone: Sebastian Berweck’s revision of the piano’ (translation into English by Philipp Blume; booklet in English and German) Research area: experimental piano music and contemporary performance practice This collection of works extends the arena of action for both the piano as an instrument and the pianist as performer. Using simple analogue electronic and preparations, these compositions reveal ‘shadow aspects’ of ‘pianism’ by transposing the way the pianist performs beyond the keyboard, and in the case of Thomas Wenks’ Recordame, dispensing with the piano altogether. Available from University of Huddersfield Press. Contains six pieces from this series, including imperfections on the surface are occasionally apparent played by edges ensemble, as well as performances by Rhodri Davies, Philip Thomas, Stephen Chase, Parkinson Saunders and Angharad Davies. Available from another timbre, along with an interview about the pieces. 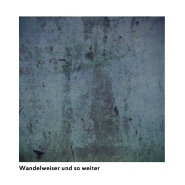 Includes various distinct spatial or temporal locations and with the same material or still, to vary the material, as well as a Parkinson Saunders recording of Manfred Werder’s 2 ausf?hrende (seiten 357-360) and Antoine Beuger’s ‘t’ aus ‘etwas (lied)’. Wandelwesier und so weiter translates as ‘Wandelweiser and so on’. The and so on is important, as this box set doesn’t aim to be a comprehensive anthology of Wandelweiser music, that function being already fulfilled by the catalogue of the Wandelweiser label itself. 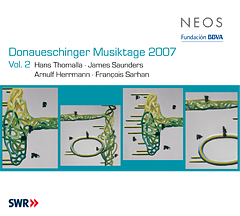 While offering new realisations of pieces by the most well-known composers in the Wandelweiser collective, Wandelweiser und so weiter focuses also and in particular on the edges of what is already a marginal music: lesser known composers at or beyond the fringes of the collective, other musicians whose work has co-existed with or retrospectively prefigured something of what Wandelweiser is about, and – above all – the confluence of Wandelweiser music with the soundworld of textural improvisation through realisations by a number of musicians who are better known as improvisers, but who in recent years have been drawn to – and have in turn affected the development of – Wandelweiser music. Available from another timbre. Includes #160304-[r], a version of #[unassigned] I made for Apartment House in 2004. This recording is part of a series of digital downloads from NMC which documents work by composers associated with the old BMIC New Voices scheme. Available from NMC.